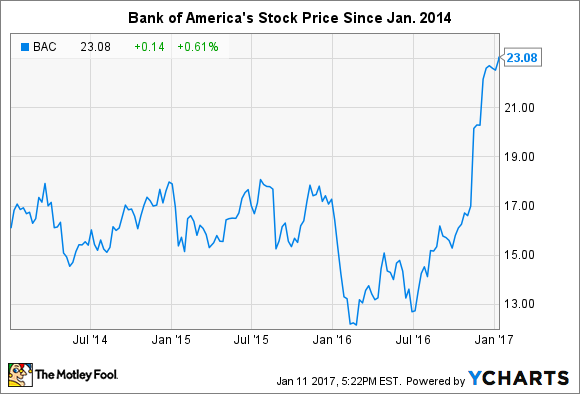 Does Bank of America's Stock Really Have 50% Upside? At least one high-profile bank analyst thinks so. Bank of America's stock seems to have only one direction to go. Image source: iStock/Thinkstock. Mike Mayo, a longtime bank industry analyst, thinks big bank stocks still have a lot of room to run despite surging 30% in the wake of the presidential election. "We see 50% upside for bank stocks over the next three years, we are bulled-up on banks," Mayo said Wednesday afternoon on CNBC. That's a bold claim, considering that banks were among the best performing stocks in 2016. And that was despite the fact that profitability in the industry continues to suffer as a result of low interest rates and an oppressive regulatory environment. But while Mayo made this claim about bank stocks in general, is it safe to assume that it covers Bank of America (NYSE:BAC) in particular? I think there's a strong argument that it does. It's important to note that Mayo didn't say that bank stocks will surge by 50% tomorrow or next week or even next year. He's giving them three years to do so. With this in mind, it certainly seems reasonable to me that Bank of America's stock could increase by at least that much. Bank of America's stock currently trades for 1.35 times its tangible book value -- though this multiple should decrease when the bank reports its fourth-quarter earnings later this week, as its tangible book value is bound to have grown over the three-month period. That's not cheap, as it's comfortably above book value, but it's far less than the two to three times tangible book value that bank stocks tend to trade at when the business cycle nears its peak. It's only a matter of time, in other words, before Bank of America's stock could increase by even more than 50%. The question is thus less about if this will happen rather than when it will happen. And on this note, I think there's reason to believe that it very well could happen within Mayo's three-year timeframe. Rising interest rates are the principal reason for this. In Bank of America's latest quarterly regulatory filing, it estimates that a 100-basis-point increase in short- and long-term interest rates should translate into $5.3 billion in added net interest income -- i.e., revenue. Since then, short-term rates have climbed by 25 basis points while long-term rates have increased by nearly 100 basis points. This alone will make Bank of America much more profitable than it's been over much of the last decade. It will also, to a point Mayo made on CNBC, allow it to earn its cost of capital, and thereby create value for shareholders. On top of this, the Federal Reserve has already signaled that it wants to continue boosting the fed funds rate, the primary short-term interest rate benchmark in the United States. According to its latest dot plot, a majority of the committee that sets monetary policy thinks that there could be three 25-basis-point interest rate hikes this year alone. And when you factor in the incoming presidential administration's promise to scale back regulations in the bank industry -- which would presumably allow banks to make more money, spend less on compliance, and return more capital to shareholders -- that should further fuel the rally in bank stocks as well. The point being, while Mayo's prediction seems bold, it also seems like there may be truth to it.